Texas Lemon Shrimp recipe by SumeraNawed at PakiRecipes.com. Cajun seasoning, lemon juice and peel spice up this simple yet elegant entree. In a large skillet, saute onion and red pepper in oil until tender. Stir in the water lemon juice, garlic , cajun seasoning, lemon peel and salt . 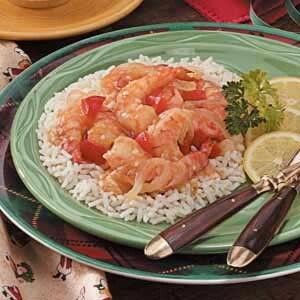 Combine cornstarch and cold water until smooth, stir into shrimp mixture. Cook and stir for 1 minute or until thickened.